Drinking the recommended 8 glasses of water a day is tricky. I mean who has the time to go fill up their glass 8 times?! Most of us have made a habit of carrying a water bottle around during the the day to solve that problem, but are we really drinking enough water? It's a known fact that if you have water readily available you will drink more of it. 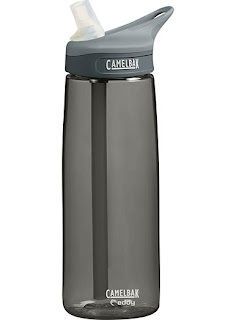 I used to carry a Klean Kanteen water bottle with me until my sister recommended I switch to Camelbak. I told her I didn't need two water bottles, but when the time came to purchase a new one I went with a Camelbak. Camelbak water bottles make it easy to get your daily water intake. The mouth piece and straw have great functionality, no need to tip the bottle up when you take a sip allowing you to drink with ease. The bottle itself is also a great size, at 25 ounces you only need to consume about 2 1/2 bottles a day to meet the daily recommendation. Cheers! *GREAT GIFT: Camelbak's make a great gift. At only $15 they are affordable and definitely practical!